"It's not the fall that kills you," as the saying goes, "it's the sudden stop at the end." 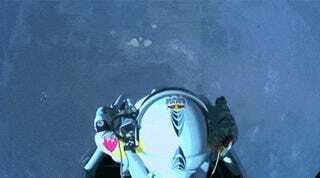 Humans are a rather splattery bunch when dropped from a sufficient height, but that hasn't kept us out of the sky. Instead, we've spent centuries perfecting the process of controlled falling to make the stop after any fall as soft as possible. The result: the modern parachute, a canopy of silk and nylon, and engineering genius. The modern parachute is a product of decades of engineering, its evolution the result of equal parts level-headed design and brass-balled daredevilry. In fact, the parachute's inception predates not only powered flight by a couple of hundred years but hot air balloon technology as well. The earliest known parachute design dates to the Renaissance period, devised by none other than Leonardo Da Vinci, and sketched out in his 1485 work Codex Atlanticus. This early parachute employed a "tent roof" design that resembled a open-based pyramid supported by a square wooden frame around the open end. As with many of Da Vinci's inventions, this early parachute prototype was never actually built during il maestro's lifetime and was mostly lost in the annals of history. Though Leonardo's design never saw the light of day, a number of other engineers and inventors continued to tinker with similar designs until 1783, when a Frenchman Louis-Sébastien Lenormand—the father of the modern parachute—fell out of a tree grasping a pair of modified umbrellas. His double-umbrella proof of concept led to the first functional parachute: a 14-foot canvas square supported by a wooden frame that proved sufficient to deliver him to the ground (unharmed!) from the roof of the 85 foot tall Montpelier observatory in France. And it wasn't until two years later that Lenormand actually coined the term "parachute" by melding "para" (Greek for "against") with "chute" (French for "fall"). While effective, wood-framed parachutes were quite cumbersome to use and transport. But in 1797 Jean-Pierre Blanchard developed and successfully demonstrated the use of a vented silk canopy—lighter, stronger, and more stable than framed linen—as a means of bailing out of hot air balloons. Over the next century, parachute design enjoyed a modest string of incremental improvements to their strength and stability, but they remained rather cumbersome. It wasn't until the 20th century that someone had the idea to stuff the contraption into a backpack rather than drag it around behind you. Rip cords, which deployed the parachute when pulled, were unsurprisingly invented around the same time. 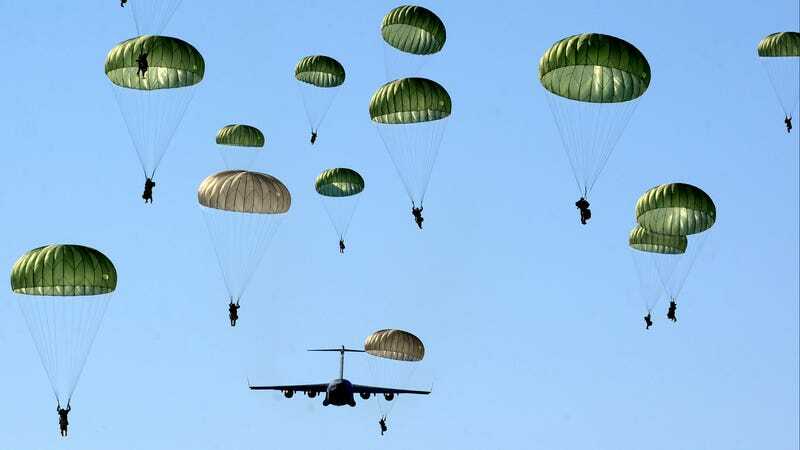 The US military also played an important role in the evolution of parachutes. In the lull between World Wars, US Army Major E. L. Hoffman had the brilliant idea to combine the best existing techniques into a single unified package: a round silk canopy deployed via rip cord from a soft backpack. And in doing so, he invented the first modern parachute, unceremoniously dubbed the Parachute Type-A. The Type-A saved countless lives over the next half century and were used extensively throughout he Second World War, but it wasn't without its drawbacks. For one, jumpers had little control over their direction of travel, making them vulnerable to obstacles like trees and more troublingly, enemy bullets. By the 1950's, though, more-durable nylon had replaced silk as the material of choice and the design of the now standard T-10 parachute allowed for a greater degree of stability and control. But the innovating isn't over; military parachutes are undergoing another transformation and the traditional circular canopy are being replaced with square-ish ones. This new T-11 style not only supports more weight (which lets soldiers to jump with more gear), it also slows the rate of descent by as much as 30 percent—down to 17 ft/s from 21 ft/s—and can cut impact force by 25 percent. In other words, it makes that final stop a lot more pleasant. What's more, the canopy also prevents issues that make a jumper swing back and forth like a pendulum, a puke-inducing problem that was an issue with the soon-to-be-old-school T-10s. The new T-11's square design actually dates back to the 1960s when kite-maker Domina Jalbert invented the parafoil—or ram-air—parachute which uses a pair of stacked rectangular nylon sheets sown together on the trailing and side edges but is open on the leading edge. You know, the ones that really let you zoom around. The rectangular design pushes air into the pocket between them, allowing for much greater steering control and lighter landings. Parafoils also boast the advantage of having a far gentler deployment than older conical 'chutes, which could inflate hard and fast enough to leave bruises, break bones, and on occasion, kill a diver before the ground was even close. A ram-airs, on the other hand, have a user-adjustable slider that lets you pick your very own preferences of super gentle to super harsh. The ram-air design proved an immediate hit with the skydiving community and has since become the dominant style of parachute for both civilian and military use.